Here you play against SoDoKo, the Space Robot Dog on a 6 x 6 grid. In the outer galaxy there are 7 different lots of spacebits. 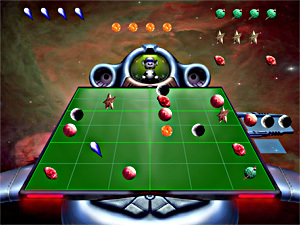 The first player picks 3 spacebits for the other player to place on the grid. He places them and he, in turn, picks 3 spacebits to give to his opponent to place. The game goes on thus. The winner is the one who, by placing on the grid, completes a row, or column, or a 3x2 block of 6 different spacebits.